Wow! Dinner number 81 already! Tired from work and not knowing what to have for dinner (and feeling pretty uninspired) went to the shops, bought some things and decided to chuck them on the BBQ. 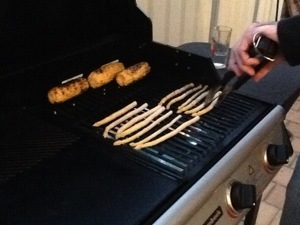 The corn and white asparagus cooking up. 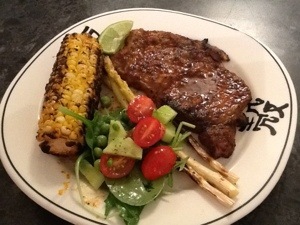 Then some steaks with a chipotle rub were cooked up too, and I rummaged around in the fridge to make a salad. And that was dinner.